Product Management is a critical component to creating a great product. Product management teams help ensure that a product is headed in the right direction – the direction that meets the market needs. Product management works with all teams involved in the product development process to understand requirements, resources, opportunities, obstacles and how together we can all create the best product possible. Because the product manager collaborates with all the teams involved in product development, they must be a generalist at design, technology, marketing, and business so that they can effectively see all sides and make sound decisions based on their expert product knowledge. 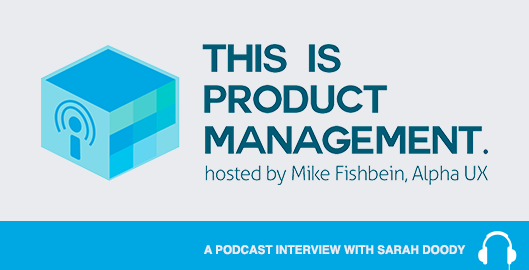 Recently I had the pleasure of being interviewed for the podcast, This Is Product Management, which focuses on helping us all understand a little bit more about the various components of creating, designing, developing, and managing a product. Where do user experience and product management intersect? How does data inform UX decisions? What are some of the most common mistakes teams make when it comes to their UX? What is “microfeedback” and how does it fit into UX? Why is storytelling an important function for product managers? What are some tips for product managers who want to collaborate well with UX designers? I’d love it if you could give the episode a listen and let me know what you think! Want me to be on your podcast? Send me an email and let’s chat!